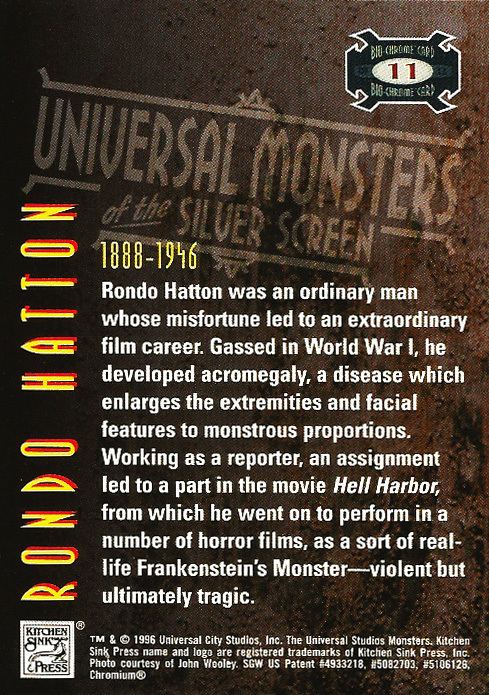 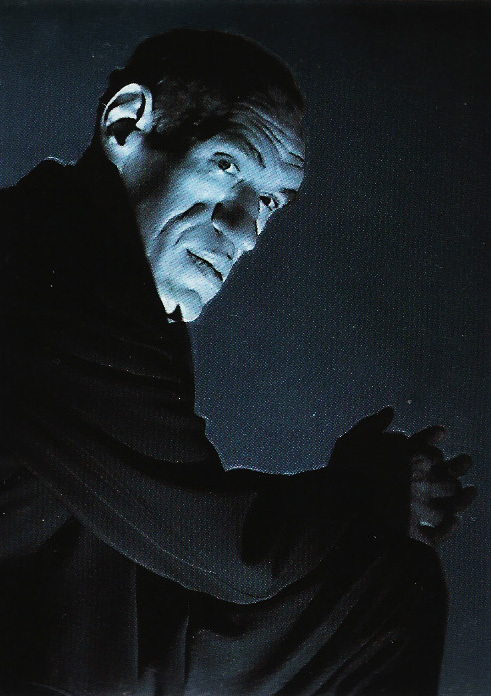 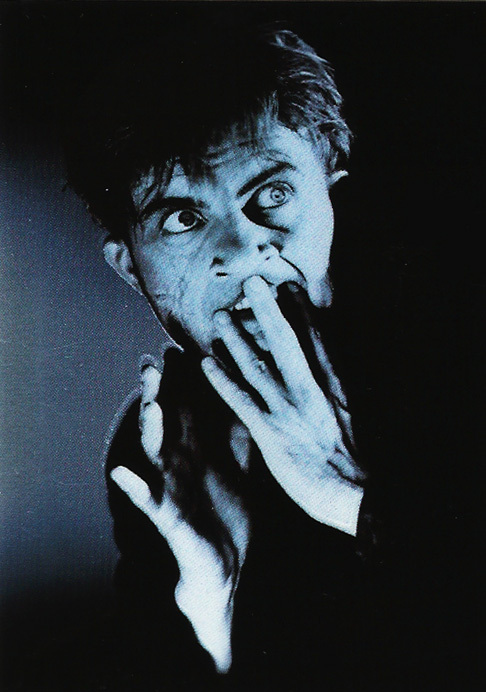 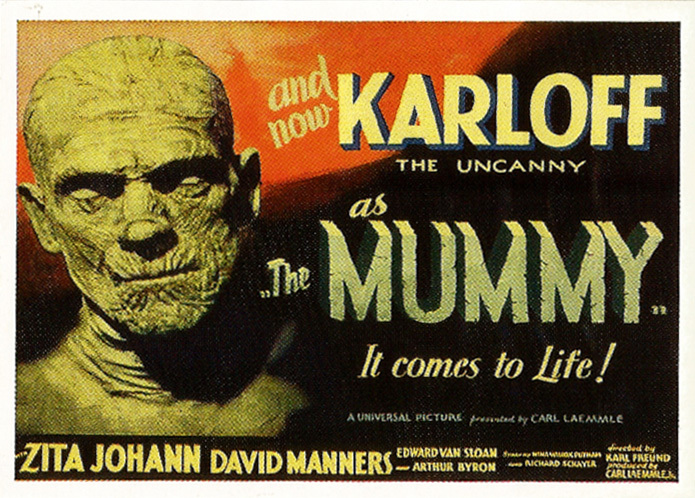 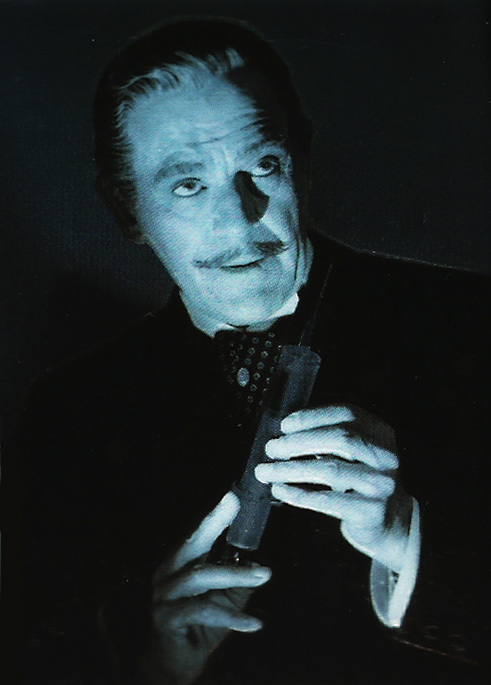 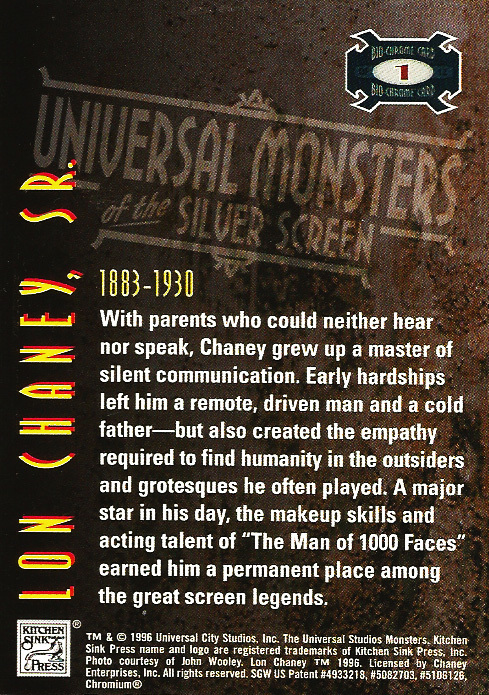 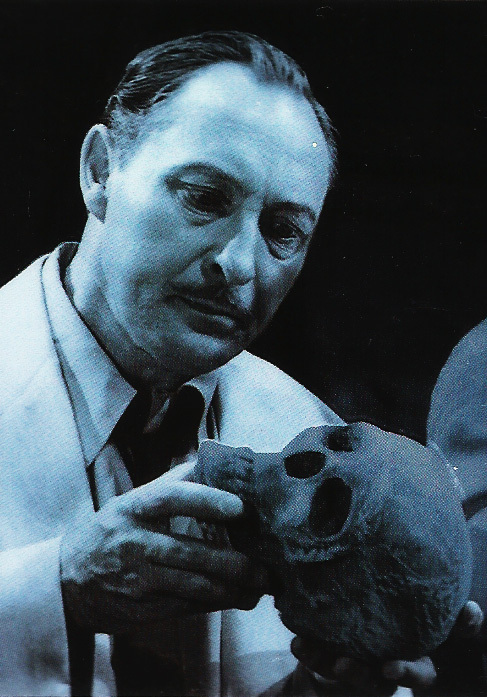 Universal Monsters of the Silver Screen Trading Cards, chase cards (1996) | 'TAIN'T THE MEAT… IT'S THE HUMANITY! 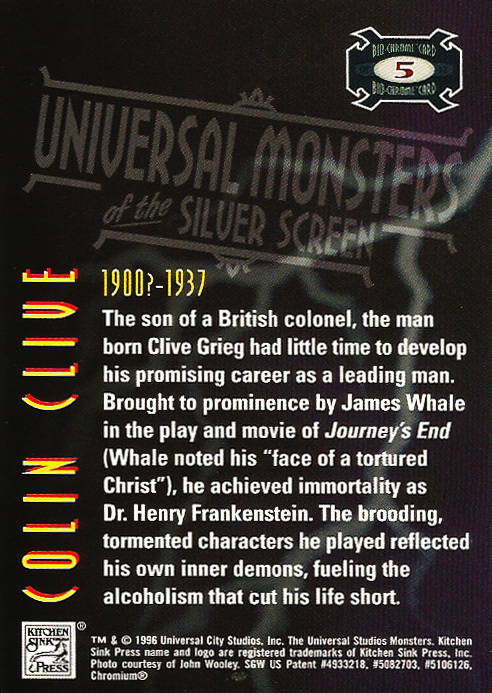 Here are the final set of cards from Universal Monsters of the Silver Screen Trading Cards, released by Kitchen Sink Press in 1996. 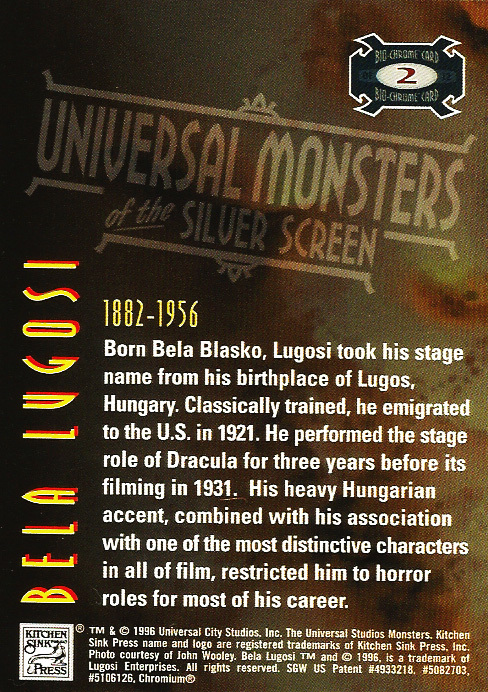 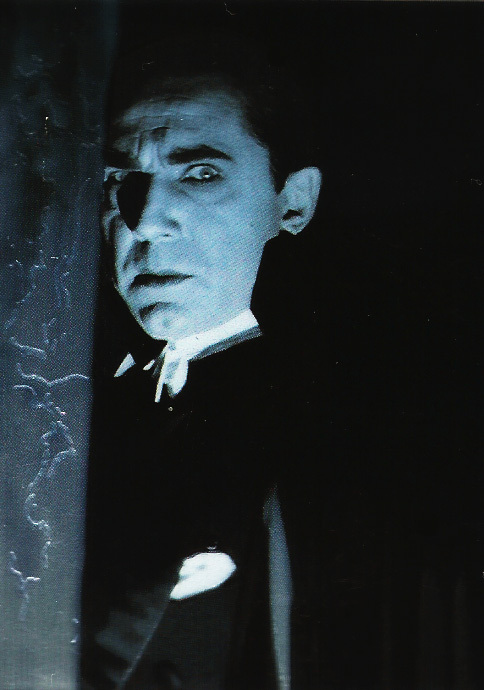 The complete set of Universal Monsters of the Silver Screen Trading Cards consisted of 90 blue-tinted base cards that showcased monsters from Universal Studios’ film output from 1923 to 1960. 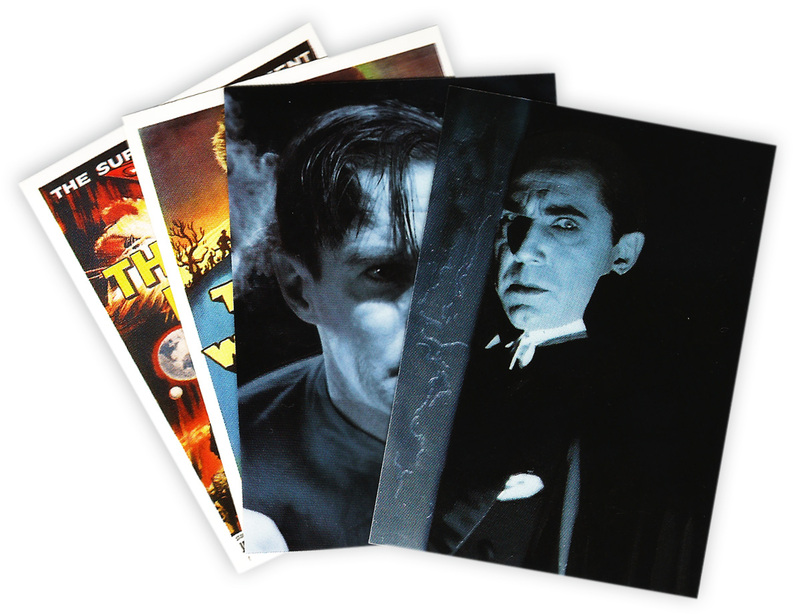 The full set also contained 10 full-colour lobby poster stickers (one shipped in each foil pack pack along with eight base cards), 12 chromium chase cards (available in 1:9 packs) and one ultra-rare card (1:432). 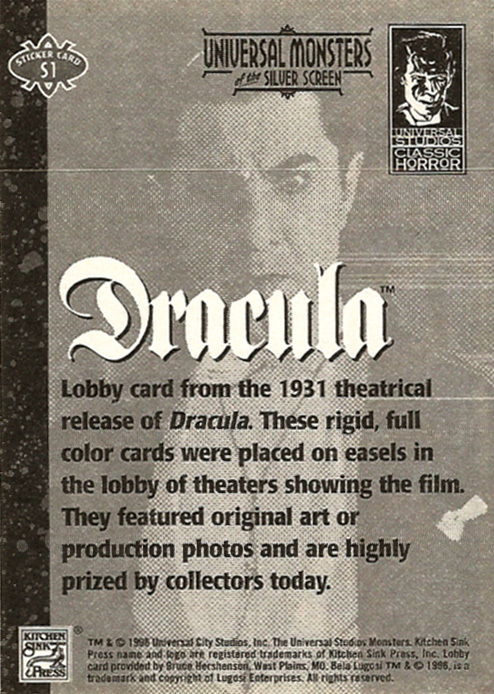 Each card measured 2.5 x 3.5 and featured a short informative caption on the back. 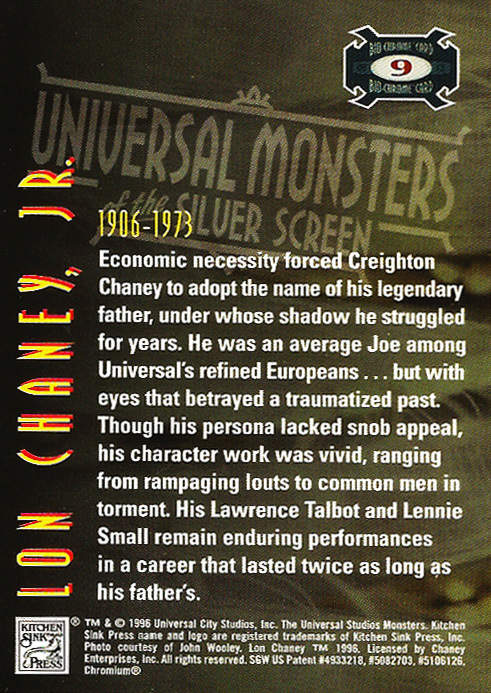 I’ve already looked at all 90 base cards (click here) which just leaves the chase cards. 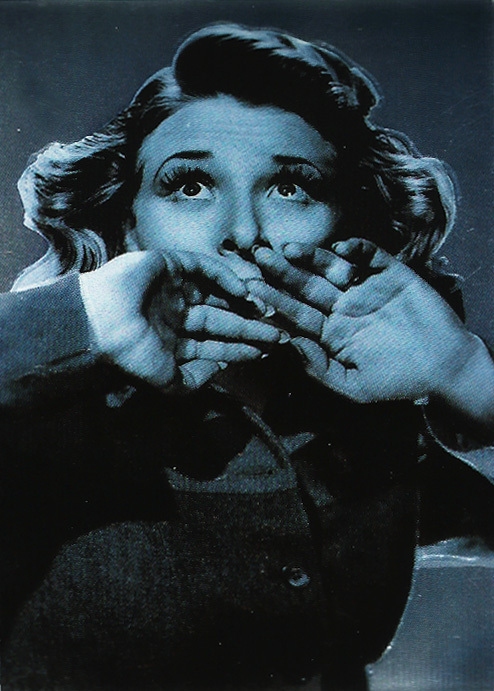 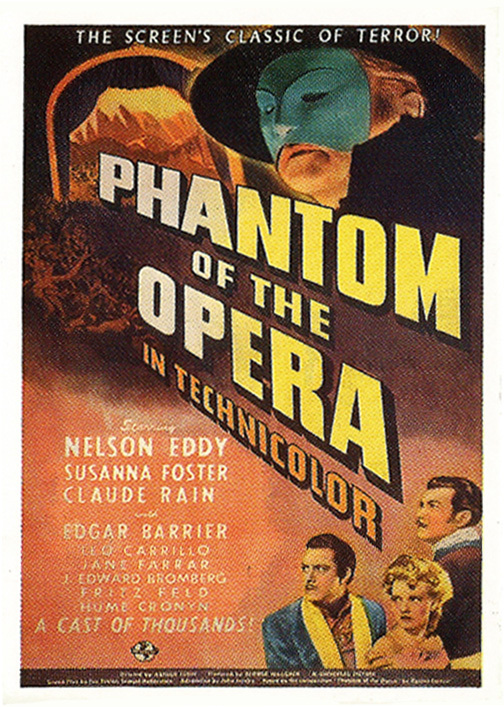 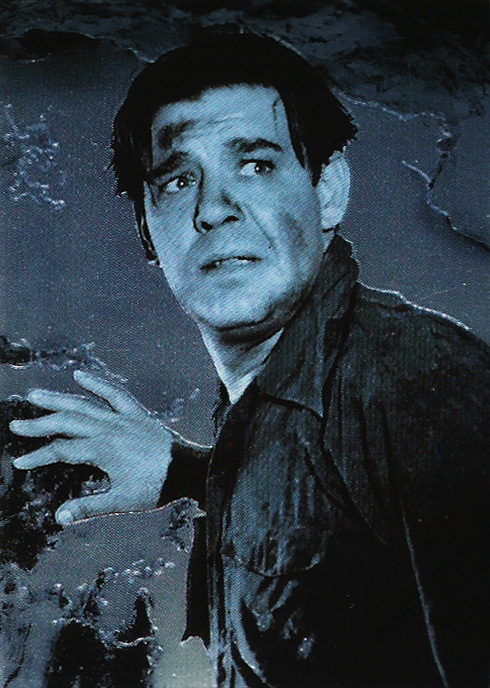 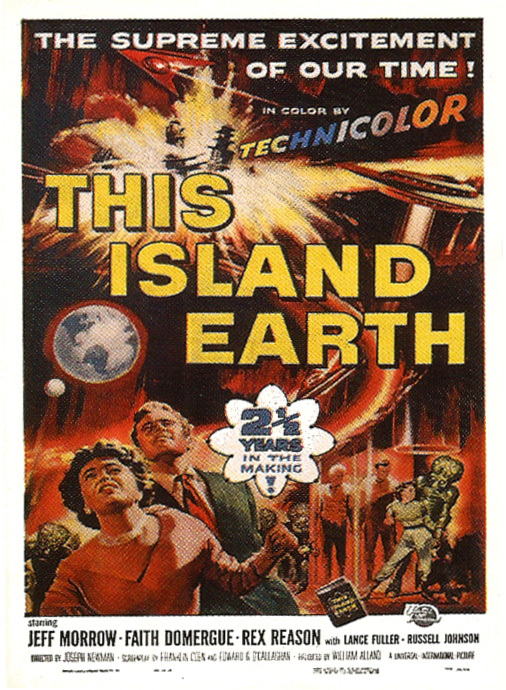 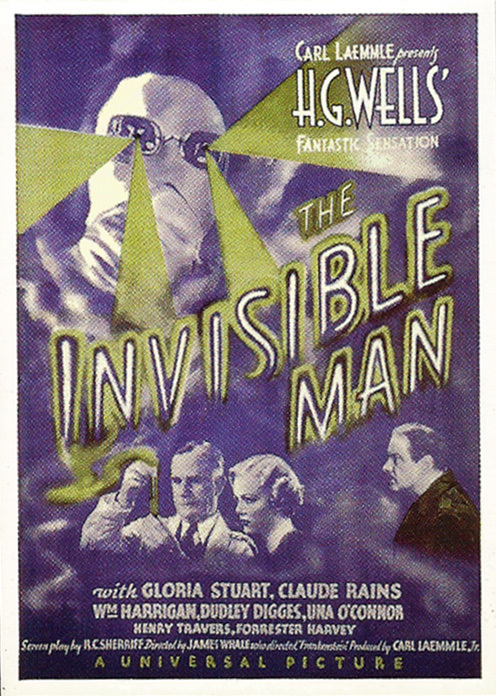 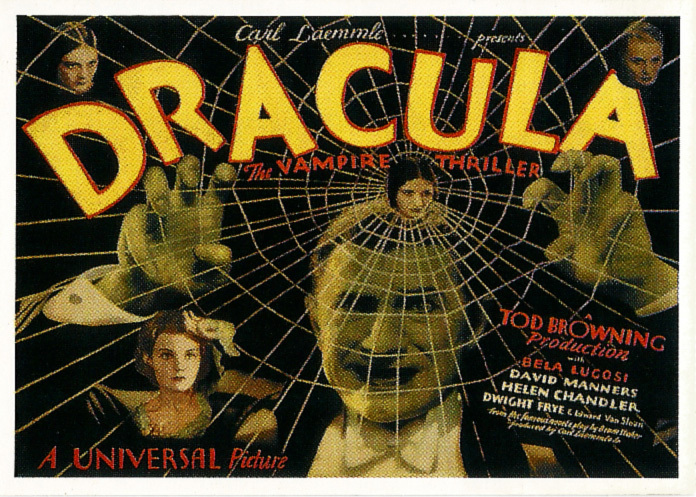 The 10 lobby poster stickers (labelled Lobby Stickers S1–S10) feature full colour reproductions of the poster cards that would have been placed in cinema lobby’s. 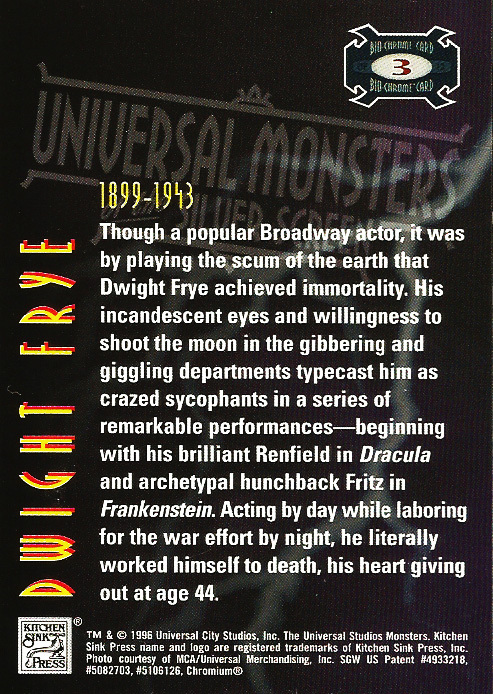 Unlike the other cards in the series the backs to these stickers feature the same text so I’ve only scanned in the back to the first sticker, shown here on the left. 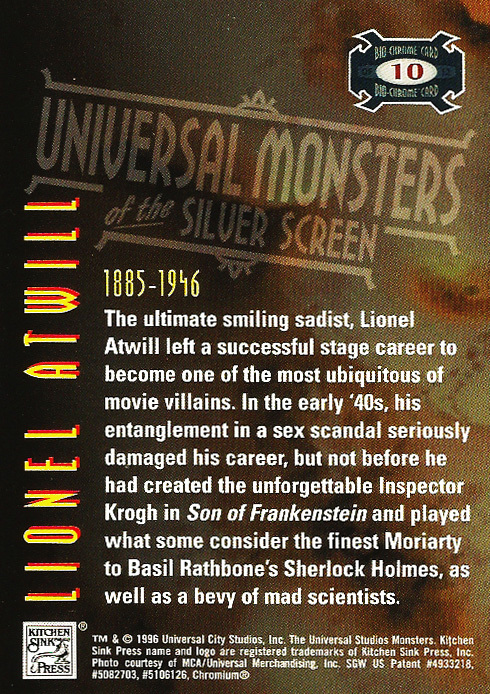 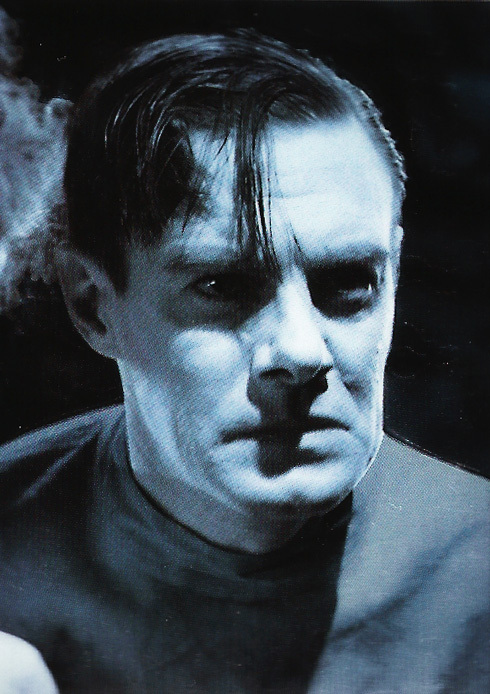 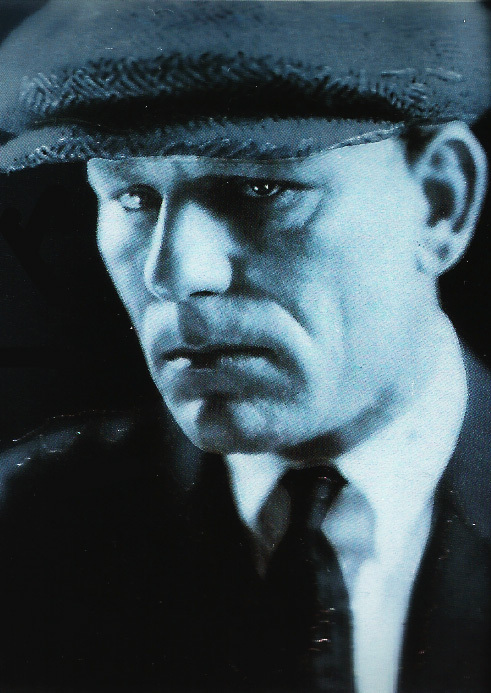 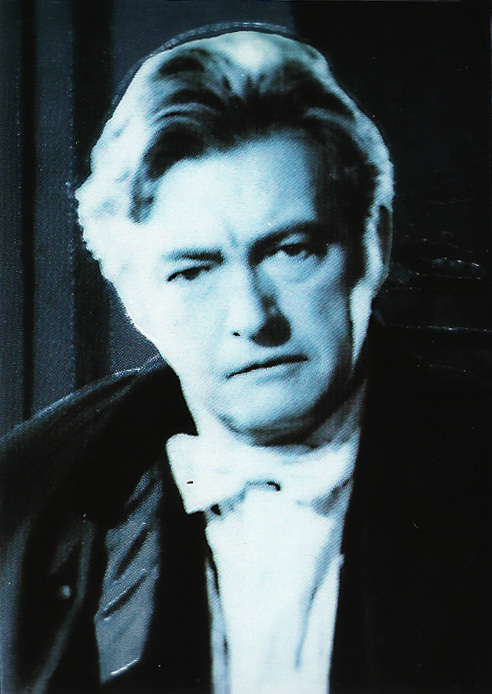 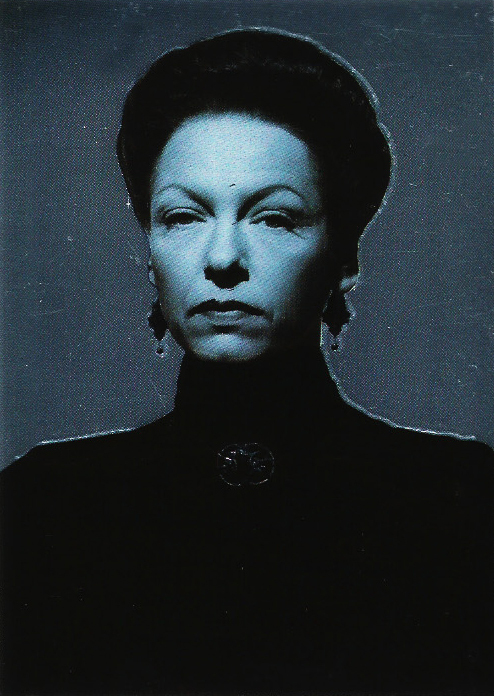 The 12 chromium cards (labelled Bio-Chrome #1–12) feature publicity shots of some of Universal Studios most famous actors. 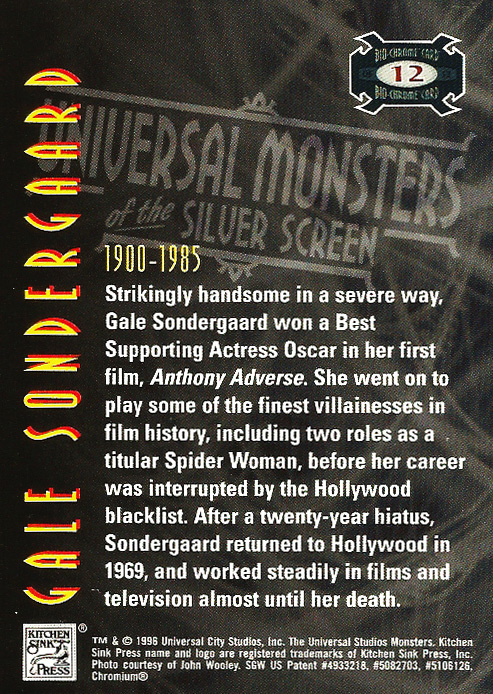 The cards themselves are printed on thicker stock than the base cards and each has a pleasing silver mirrored effect. 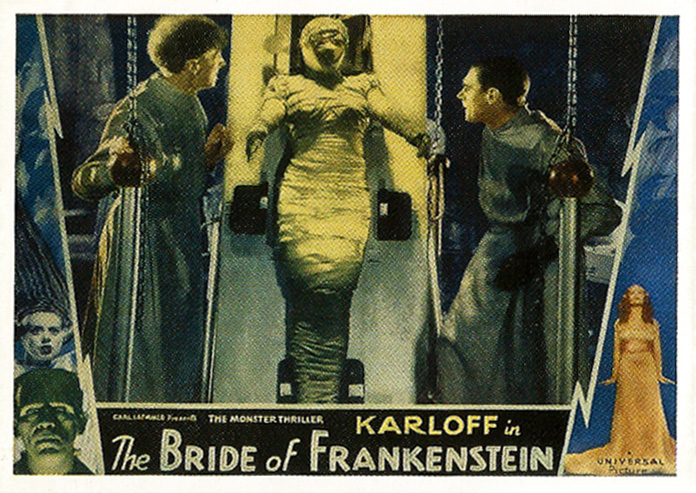 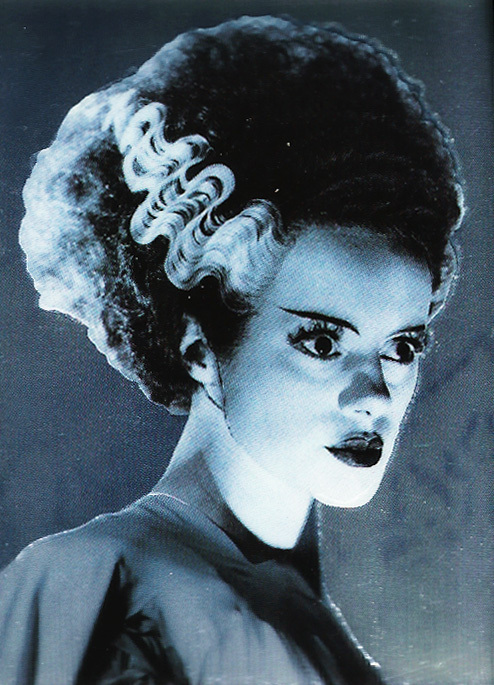 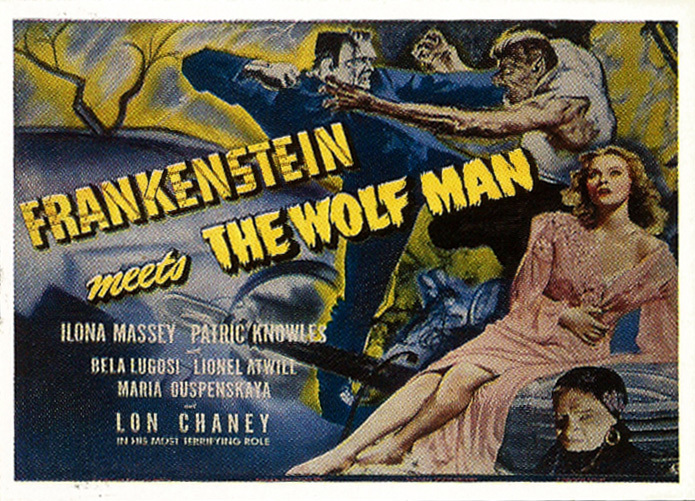 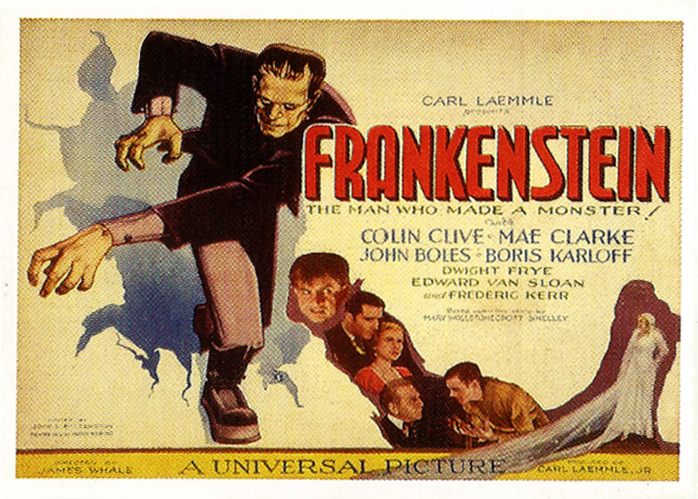 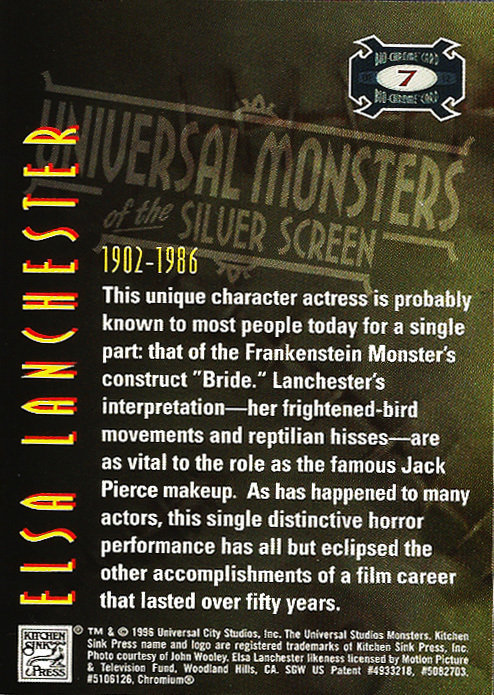 There was one more card in this collection, the Ultra-Chase card that featured The Bride of Frankenstein (labelled U1). 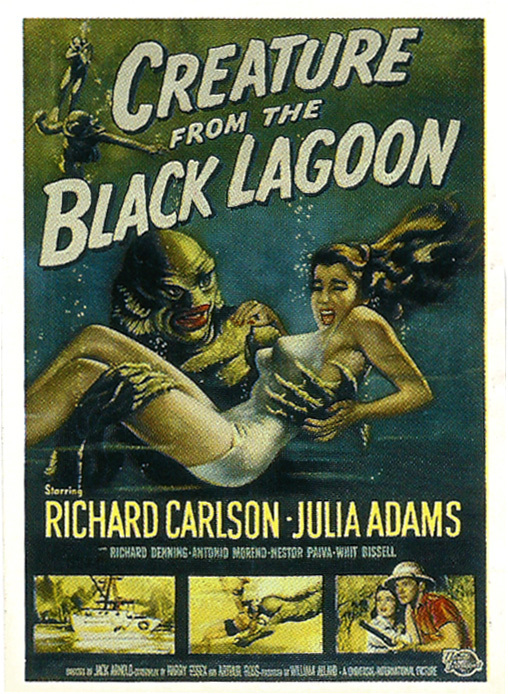 Unfortunately I haven’t been able to track one down (and it’s not for want of looking believe me). 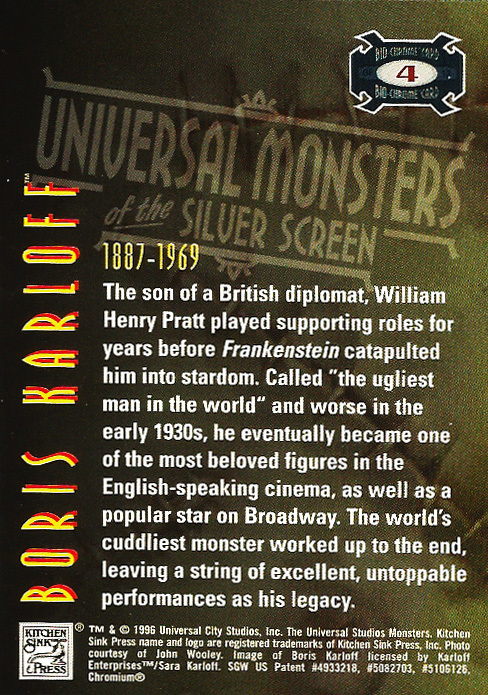 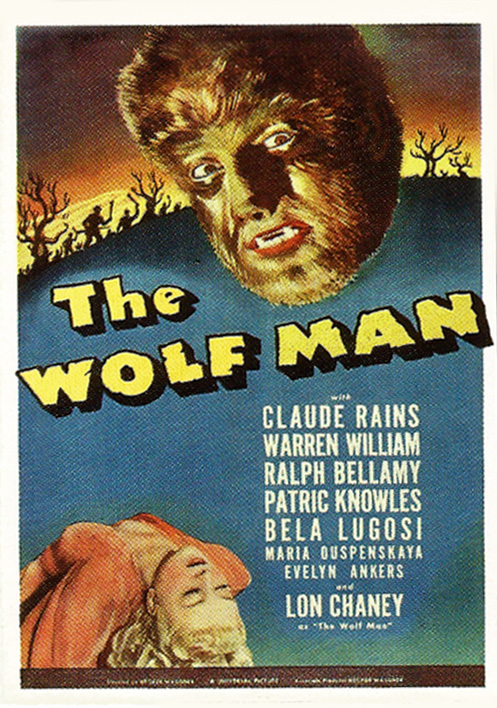 Universal Monsters of the Silver Screen Trading Cards is a great collection that pays homage to some of cinema’s most iconic films and characters. 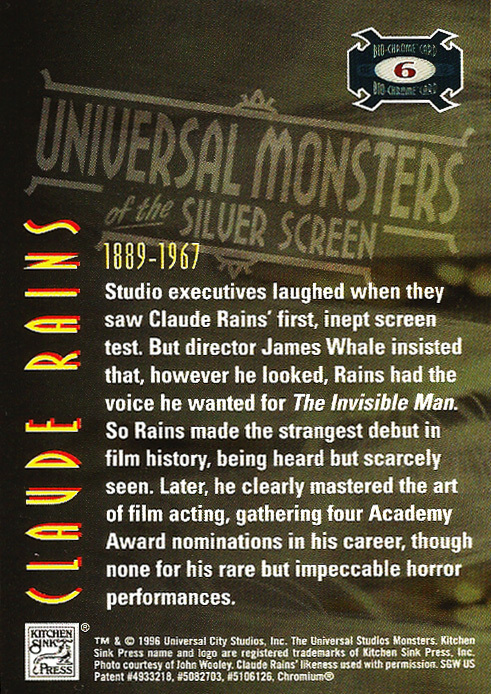 The quality of the cards is very high, especially the Chromium cards, and the set is a treat for fans of these classic monster films.